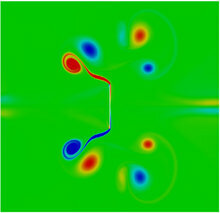 The flow physics induced by the harmonic motion of a rigid thin lamina in a quiescent viscous fluid is investigated numerically by a combined lattice Boltzmann-immersed boundary approach. Consistency and accuracy are carefully examined and validated against experimental results for oscillations of small and moderate amplitudes, and against analytical predictions for zero-amplitude oscillations. Comparisons with previous lattice Boltzmann simulations highlight the benefit of the present approach in terms of accuracy. A new empirical law for the hydrodynamic function, which accounts for oscillations of large amplitudes (similar to the length of the lamina) is introduced.